I had an absolute ball (get it) making the goodies for a Cinderella themed birthday party this year. The lucky little girl turned one, so it was all about cute accents and keeping things simple. What better than delicious decorated sugar cookies. The main event for me was the birthday cake which was Cinderella's carriage. I didn't really keep it simple with that I guess. 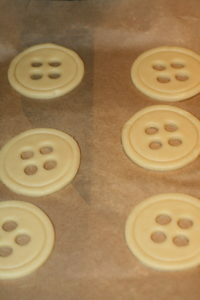 But I also made cute little button sugar cookies or biscuits, as we call them here in the UK. I found the cutter on eBay and used some of the remaining fondant from the cake to decorate some of them. I also used white fondant, left some bare and all the edible luster dust I could get my hands on! The recipe for the cookies is by Sweetsugarbelle and you'll find a link to it on my Blogs I Love page. She is a gem and I take no credit for this recipe at all. It's all her! The only thing I have done here is to convert the measurements to UK friendly values. Other than that it is, 100%, not my recipe. But trust me when I say, her recipe won't let you down. I've said before that I don't really make biscuits or cookies because they are usually a lot of effort for not as dramatic a reward. Not compared to cupcakes, muffins or cakes. But in this instance, they were totally worth it. I won't go into how to make the biscuits themselves. The instructions are on Sweetsugarbelle's blog and I doubt I can do a better job of explaining it. So this is more about the decoration. One thing I will say though is that I tend to judge most baked good on their raw taste. If a cake batter isn't yummy, the final product isn't going to be any better. On the other hand, if the cookie dough makes you want to eat the whole batch once you've mixed it, you know it'll be worth eating when baked. That's how I feel about this biscuit dough. The idea behind the design is that poor ol' Cinders is always cooking, cleaning and sewing. In the film, when it comes time to make her dress she has no time, so all the cute little animals stitch it for her. The buttons just seemed to work with the 'seamstress' narrative and so I glitzed them up. I thought they might make nice little party bag treats too. 1st birthdays are more about the parents and family than the children. But there will, of course, be kiddies there too. If they are very young little plastic toys and lollies in a bag isn't a great option but biscuits are pretty harmless. Apart from being full of sugar of course. Please enjoy responsibly. I could have made pumpkin cookies I suppose, but being so close to Halloween ... well, they might feel like leftovers. Also, my royal icing skills need some work and buttons felt like a more straight forward design. Usually, I'd say fondant on a biscuit is a waste of a biscuit but this was Marshmallow Fondant and is, in fact, delicious in its own right. So it was ok. Royal icing would have been better, but this had a great look. I sprayed the plain biscuits with Dr Oetker Silver Lustre spray. The Blue ones were dusted with Rainbow Dust's 'Metallic Light Silver' mixed with Rejuvenator. And I buffed the White ones with Sunflower Sugar Art, Pearl powder 'Super Pearl'. I like the white and plain sugar cookies best I think - as with the Cinderella Carriage Cake itself, I need to work on my luster dust on fondant painting skills. Let me know what you think? What is your favourite sugar cookie recipe for decorating? What Cinderella themed biscuit would you have liked to see?